Peter Martin: Who'll face up to the pharmacy protection racket? Have you heard about the inquiry into the rules governing pharmacies and what they get paid? I'll let you in on a secret. It's secret, even though the Health Minister received its report six weeks ago. Which is odd, because Greg Hunt has been acting as if there's no report to consider. Just last week he introduced proposed legislation that would entrench in law one of the key protections the inquiry was examining. Until now, the so-called location rules have been the result of a contract signed between the Pharmacy Guild and the government, renewed every five years. If Hunt's proposal gets through, they'll remain in place indefinitely, until the law is rescinded or amended. Hunt and the guild agreed to make the rules indefinite back in the middle of the year while the inquiry was under way. If its report is critical of those rules when Hunt finally makes it public, he'll be embarrassed, but it will be too late. Last month at a small gathering of health economists at Old Parliament House in Canberra, the inquiry's chairman, Stephen King, provided an insight into what it will say. For pharmacy owners the location rules are "the equivalent of falling down a gold mine". But they need to continuously change and refine them because there's money to be made competing with the monopolies that benefit from them and money to be made shutting that competition down. It's like a giant game of Whack-A-Mole. The 56-page location-rule handbook outlines the need for surveyor's reports (23 times) and the importance of confirmation "that the measurement has been undertaken from the mid point at ground level of the public access door of each of the premises". The rules originally allowed a qualified pharmacist to set up a new pharmacy with no constraints whatsoever as long as it wasn't within 10 kilometres of an existing one. "A pharmacy in Gympie in Queensland, a Chemist Warehouse, has set up 10 kilometres out of town," King told the gathering. "And because it provides what consumers think is a great service at a great price, people have been travelling 10 kilometres to get there. It's actually got other shops around it now, because it has drawn customers to it. "Now obviously that was unreasonable competition," he added, sarcastically. "It had to be stopped. That pharmacist wouldn't be allowed to set up in that location today. Later versions of the rules say there has to be 'enough demand'. "The rules create local monopolies. If an area grows, an extra pharmacy provider number becomes available. Under the rules the existing owner is allowed to apply for it and usually gets it. "We have been to parts of Australia where there, I think it was Alice Springs, where there were four pharmacies. We didn't realise they were all owned by the same people. They all had different brands, creating the appearance of competition, but they were clearly not competing. "In Broome three out of the four pharmacies were owned by the same people. We turned up to the first and said we were going to the next one afterwards. They said: 'Why are you doing that? We own that one as well.' 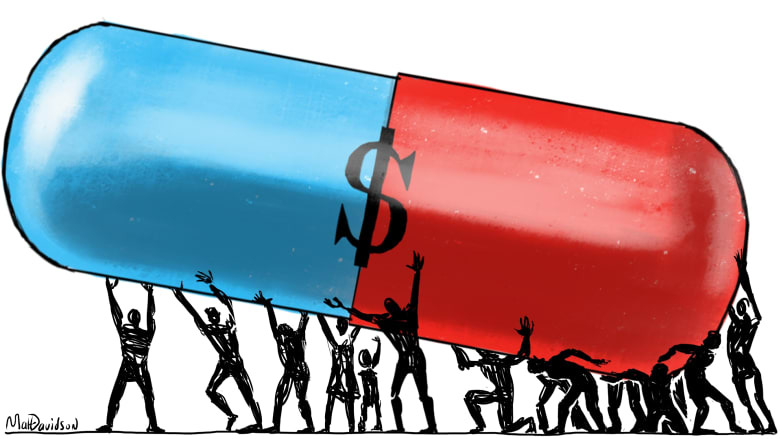 "
Local monopolies mean prescription prices are higher than they should be. But King was unable to find out how much higher. "Pharmacists are agents of government; the government pays them, on average, $11.50 for each item they dispense. We tried to find out what their costs were. We asked the guild to tell us. It does an annual survey of its members. It said it couldn't give us that information because it was provided only for the purposes of the survey. "So we said: can you go back to your members and ask if that information can be shared, confidentially. The guild said no, so we did our own survey. Unfortunately, the guild then sent around a message suggesting its members not engage with our survey. Very few did. But the best information we could get is that the efficient dispensing fee would be beneath $10 and probably somewhere between $8 and $9. The caveat is that the information isn't very good. After two years of looking at this, I still can't get the data. No one can, with the possible exception of the guild. "But you can get an idea by looking at prices in the inner areas of Sydney and Melbourne where there is competition. They offer dollar discounts which come out of pharmacists' pockets. But they are not offered in the outer suburbs, and they are not offered in rural Australia." As a "thought experiment" King considered withdrawing the business and tendering it out. "Maybe you could offer two locations on each side of a main street. Would-be dispensers could tender by offering the lowest fee they would be prepared to accept." On Tuesday the Productivity Commission (on whose board King sits, although he wasn't involved in the latest inquiry) went further. It wants the business taken away from pharmacies and given to machines of the kind that are common in Canada. They dispense quickly and accurately for a fraction of the price.